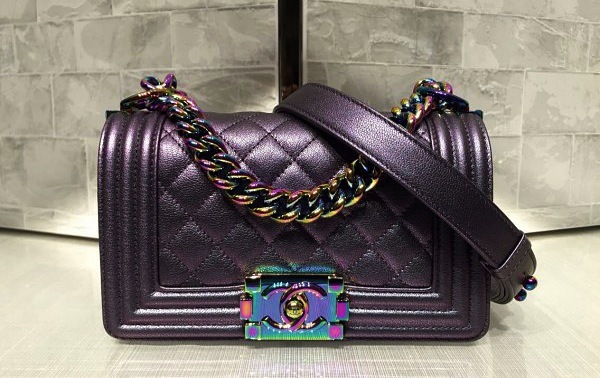 It’s been branded the mermaid bag by online fashion bloggers, due to its metallic sheen and oil slick appearance, but the Chanel Small Boy Bag in Metallic Iridescent is everything! I personally came across this bag a few days ago when I was checking out the Chanel Cruise 2016 collection on their website and I completely fell in love. 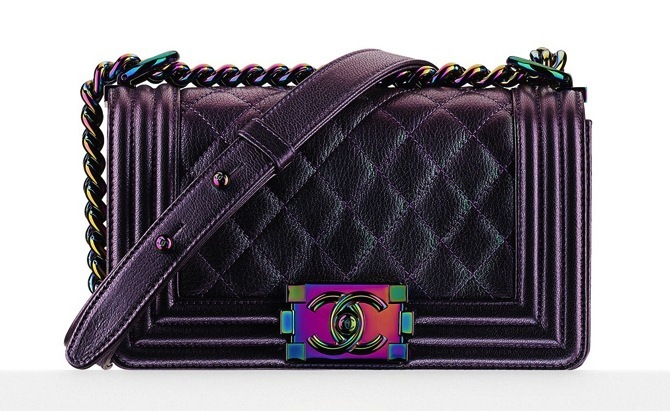 The moment I saw the purple sheen and the iridescent hardware, my eyes were instantly drawn to its beauty. The purple sheen on the goat leather changes to a pearly green and blue as the light moves, while the chain itself is an iridescent rainbow of beauty, as is the lock closure and all its hardware. Combining these together definitely makes it mermaid appropriate, I think you would agree? I’m not lucky enough to own this amazing bag, but a few people on The Purse Forum and on YouTube definitely are, so I have compiled their photos together as well as two video reviews of the Metallic Iridescent Boy Bag for you to check it out for yourself, all in one place, and decide whether or not you love it. One of the girls in the video said it’s the most beautiful bag she has ever seen and couldn’t stop staring at it. Are any of you lucky enough to own this beautiful bag yourself? I’d love for you to share your opinions on it too! I’ve always been a fan of Chanel, owning one of their gorgeous Velvet Boy Bags in Bordeaux from last season and adoring their classics, but I have to say that the brand is definitely upping their game right now in terms of pushing the boundaries. I’ve always found the French fashion house sticks to seasonal pieces and isn’t very daring, but in recent years, they have truly stepped outside their comfort zone and created bags which have been stunning, much like this metallic one here. It makes me excited to see what’s to come from Chanel in seasons to come. As this is impossible to find, buy a very similar Rebecca Minkoff version here. If the Boy Bag is not your thing, it also comes in the Flap Bag as well! So there’s a style for everyone! 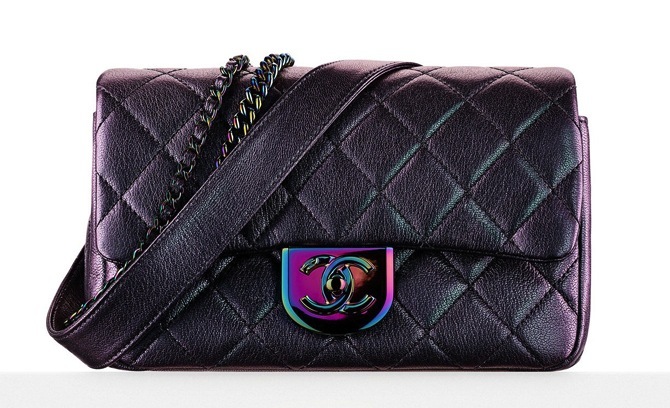 Check out the Chanel Small Flap Bag in Metallic Iridescent here. Isn’t it beautiful? I’d love to know which bag you prefer though in this metallic purple, the Boy or the Flap? Let us here at Fashion Runway Blog know! Is it true French pay cheaper for handbags as they need not to pay tax? No I don’t think that’s true, I’m not certain, but from what I know in Europe they have their own tax for each country. The prices in France are cheaper than in the UK, but in the US the prices are cheaper than in France and the UK, due to the exchange rates working out that way. I’m pretty sure France has to pay tax though. Yes, this boy bag is my thing. I love this bag. As for French, we do pay VAT (equivalent as sales tax in the US) in France. This is 20% on the top of the retail price. But if you’re a tourist, you can claim the VAT bag, which makes it cheaper to buy in France than in other non EU countries.